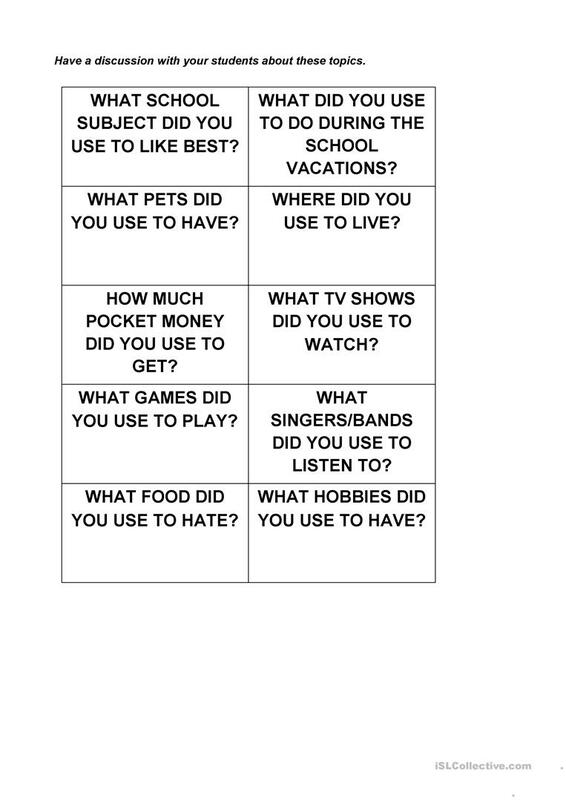 You can use these cards to have a discussion with your students, about things they regularly did in the past. The above downloadable printable is meant for business/professional students, high school students and adults at Elementary (A1), Pre-intermediate (A2) and Intermediate (B1) level. It is great for consolidating Past tense expressed with USED TO in English, and is excellent for strengthening your learners' Speaking skills. PsychoFat is from/lives in Indonesia and has been a member of iSLCollective since 2012-12-04 03:43:39. PsychoFat last logged in on 2017-10-11 09:20:26, and has shared 1 resources on iSLCollective so far.